After I finished the Zig Zag Jeans Quilt I have been trying to use up the huge pile of scraps that was left. I thought it would be great if I could get some inspiration from my blog friends. Design something by recycling/upcycling denim. Make anything. It doesn't have to be a sewing project. Get creative! Rip it, stitch it, paint it, glue it, staple it, etc. Enter as many projects as you want. The winner will be announced on Saturday August 28th. 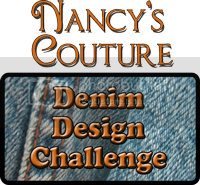 To enter your project click the Denim Design Entries tab in the menu bar. The winner will recieve a custom made Inspiration Bracelet. I would love for you to grab a button from the side bar and spread the word so others could join in the fun! sounds fun- i'm in- when is the deadline?